What does it mean to be a “feminist” today? Explore how one word is heard many ways. advocating social, political, legal, and economic rights for women equal to those of men. Take a closer look at the words used to describe Feminists, and why it's still considered a controversial subject today. What “Should” A Feminist Look Like? One woman takes this question head on. What do you hear when someone says "I'm not a feminist?" How do you see media influencing the way we understand gender equality? Use the hashtag #WhatIHearPBS to share your thoughts. Dig deeper into the conversation with a detailed Viewing Guide: What I Hear When You Say: Feminism. 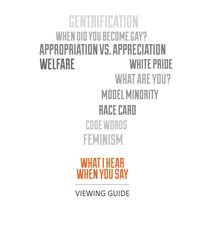 Explore common code words & phrases used in conversations about race & identity. © 2017 Public Broadcasting Service (PBS). All rights reserved.